Florence is a beautiful city but can be crowded. 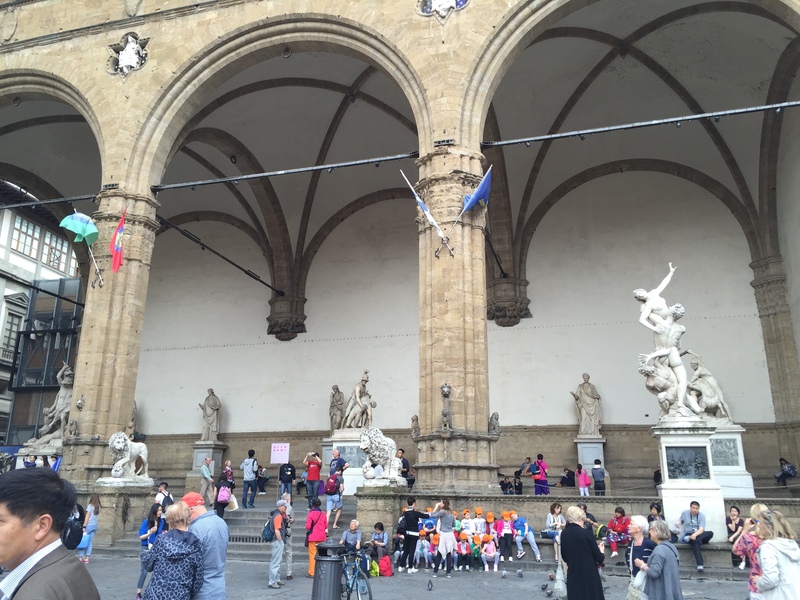 We went early in the season but there was still crowds at David and the Uffizi. You can buy a Florence pass but it is very expensive. It is worthwhile only if you will hit most places you can use it in the time frame designated. A better choice is to buy a reservation for 4 Euros. This gives you a half hour time slot that you get in a special line and basically walk in. 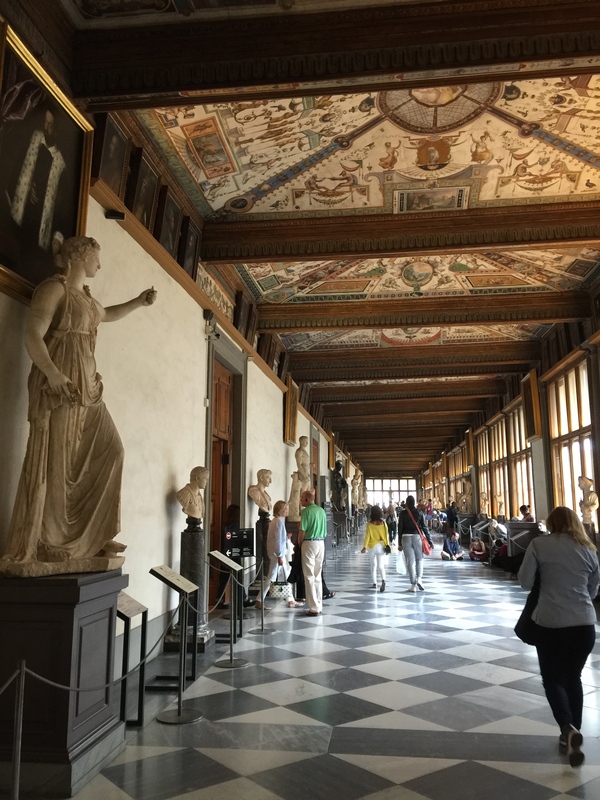 David and the Uffizi had hour long lines but we went in with our reservations in a few minutes. 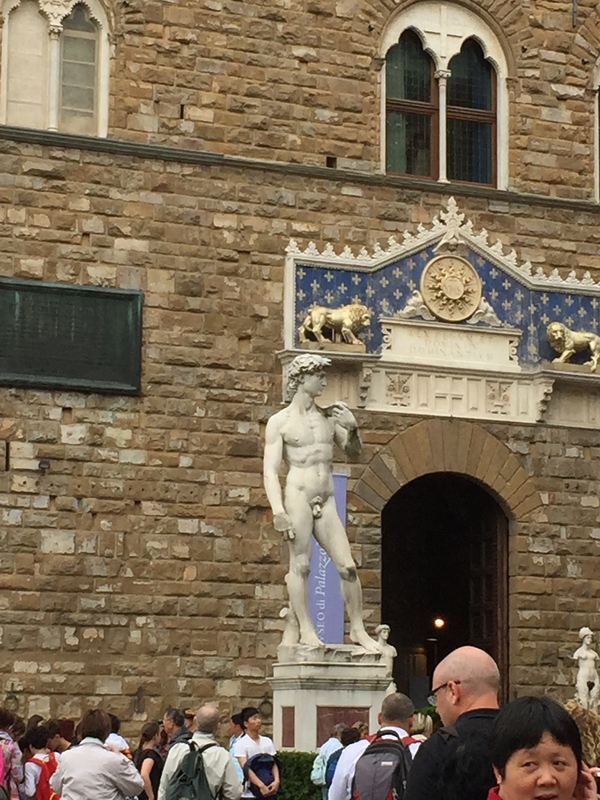 David is at the Accademia Gallery Museum in Florence. There are many things to see here besides David but David is magnificent. His skin looks like flesh not marble. In his left hand is a slingshot and a stone in his right. He is ready for Goliath. There is a small tree stump behind his right leg. This helps support the large statues weight. It keeps it from toppling over. 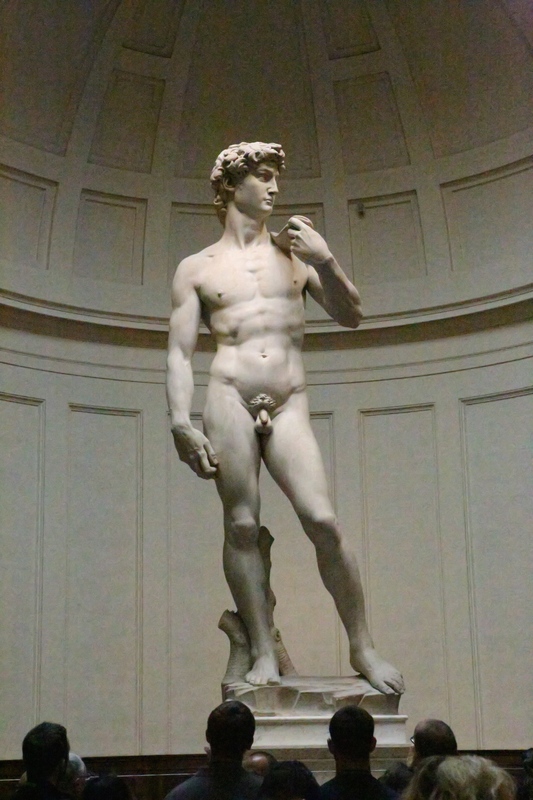 He was originally in the piazza near the Uffizi but the weather would have destroyed him. They moved him into the museum and made a replica for the piazza. 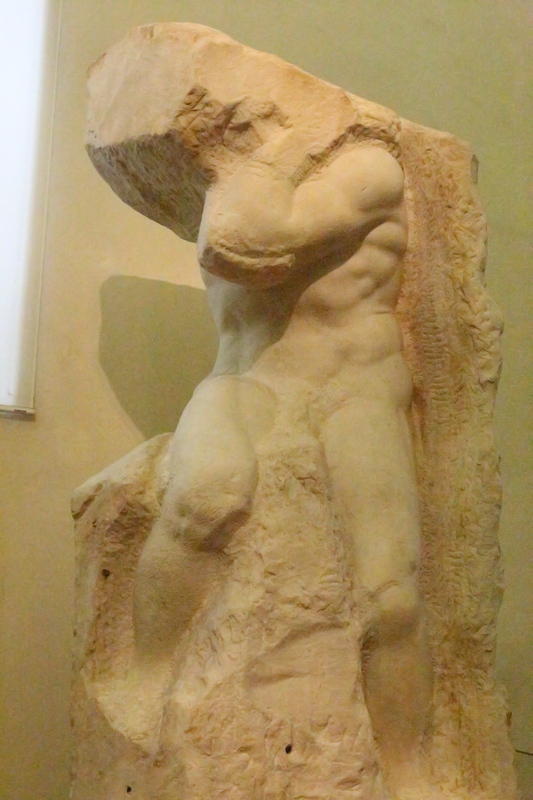 There are unfinished statues in the museum as well. Michelangelo felt they were done! They were breaking out of the stone and he could do no more to improve them. 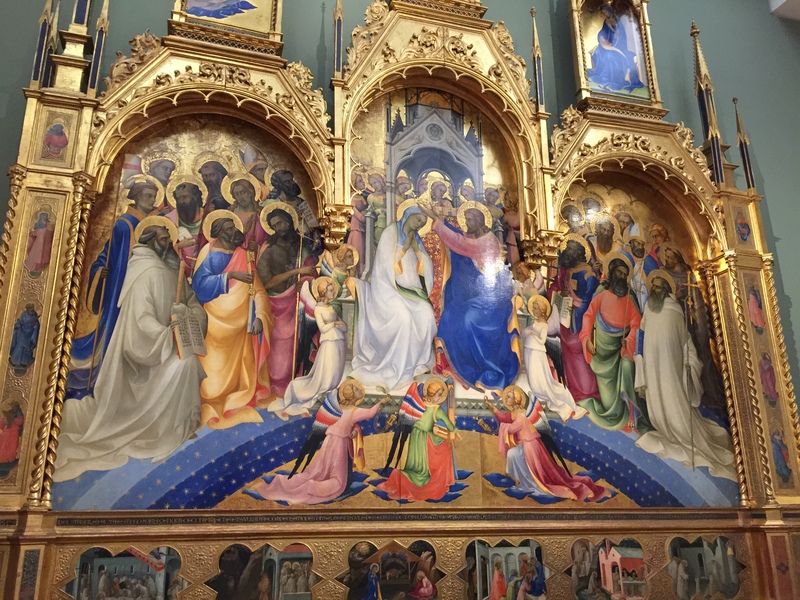 The church of Santa Croce is another large and beautiful church. It can also have lines but there is a peaceful feeling inside. Crossing the Ponte Vecchio and turning right leads to an old area that was the artist area. There are still some along the main streets but high prices have moved most of them out of Florence. Enjoy your stay in Florence. Spend at least 3 nights (two full days). Buy reservations and enjoy what this great city has to offer. Tomorrow we drive south on the Autostrada to our home in Velina (Campania).